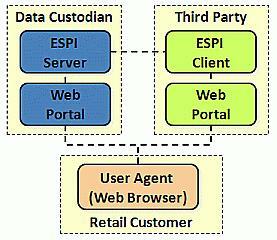 The purpose of the NAESB Energy Services Provider Interface (ESPI) standard (REQ.21) is to create a standardized process and interface for the exchange of a retail customer’s energy usage information between their designated data custodian (i.e. distribution company) and an authorized third party service provider. Providing a consistent method for the authorization of third party access to retail consumer’s usage information and a standardized interface for the exchange of the that information will support the development of innovative products that will allow consumers to better understand their energy usage and to make more economical decisions about their usage. The NAESB ESPI standard provides model business practices, use cases, models and an XML schema that describe the mechanisms by which the orchestrated exchange of energy usage information may be enabled. The NAESB standards development effort was conducted with the support of the National Institute of Standards & Technology and the Smart Grid Interoperability Panel and serves as an extension of the NAESB Energy Usage Information Model developed at the request of NIST and the SGIP. In September 2011, Aneesh Chopra and the Office of Science and Technology Policy challenged the electric utility industry to launch a Green Button Initiative that would give consumers access to their energy usage information in a downloadable, easy-to-read format. This initiative is modeled after the Administration’s Blue Button Initiative, which allows patients to electronically access and download their health information and share it with health care providers. In response to the Chopra's challenge, several major utilities in California are in the process of developing a “green button” that would allow consumers to access their energy usage information on-line and download it through a simple click of the button. The NAESB ESPI standard served as the basis for this new capability. Department of Veterans Affairs is the registered owner of the Service Marks “Blue Button,” the Blue Button logo, and the slogan “Download My Data,” modified for Green Button use with permission. To support the Ontario Ministry of Energy Green Button Initiative, the Ontario Ministry of Energy has developed the following Reference Architecture. As the Reference Architecture contains copyright protected lanuage, the Reference Architecture is protected and may be accessed by NAESB members as posted below. Non-members may access the Reference Architecture by contacting the NAESB office at naesb@naesb.org and choosing one of the options as outlined in the next section. NAESB Membership: Member companies and their employees have full access to all NAESB standards, contracts, manuals and other documents in addition to other membership benefits ($7,000/year). To inquire about NAESB membership, please contact the NAESB office via email (naesb@naesb.org) or phone (713 356-0060). Purchase Individual Versions of Standards: Companies may purchase individual versions of the entire set of standards developed by a single quadrant ($2,000/version). To purchase and individual version, please submit a Materials Order Form to the NAESB office. Purchase Individual Standards / Manuals: Companies may purchase individual standards (final actions) / manuals ($250 final actions / $250 manual). To purchase an individual standard, please submit a Materials Order Form to the NAESB office. All NAESB Standards are protected under United States Copyright laws. The same copyright protection applies to much of the other materials published by NAESB. The penalties for copyright infringement may be found here. Derivative work products of NAESB standards as defined by the United States Copyright Act 17 U.S.C. § 101 and are permissible given that the work product is significantly different – substantial and material. Work products based upon NAESB standards or schemas included in NAESB standards are not considered derivative if they simply include additional software libraries or are considered an enhanced version of the original. In order for a work product to be considered significantly different there should be substantial and material modifications to the source coding. To ensure that a work is understood to be derivative and not in violation of the NAESB copyright policy, an entity should discuss its use with NAESB. The NAESB Copyright Policy may be found here. The NAESB Intellectual Property Rights Policy Concerning Contributions and Comments may be found here.